Baron de Saint-Julien; (his sale, Hôtel de Bullion, Paris, 21 June 1784 and days following, no. 69 [a pair of Chardin still lifes]); Dulac. Peter Adolf Hall [1739-1793], Paris; by inheritance in his family to a descendant of his daughter Lucie; (sale, Galerie Georges Petit, Paris, 13 March 1922, no. 9); (Wildenstein & Co., Inc., Paris, New York, and London); sold to William R. [1866-1949] and Lillian S. [1881-1959] Timken, New York, by 1933; (Paul Drey, New York); purchased May 1937 by W. Averell [1891-1986] and Marie N.[1903-1970] Harriman, New York; W. Averell Harriman Foundation, New York; gift 1972 to NGA. The title page of the 1874 sale catalogue reads "...Cabinet de M. le Baron de Saint J***," and the seller is further identified by hand-written annotations to the title page and by Frits Lugt as Baron de Saint J[ulien]. Although two Saint-Juliens have been confused in the literature, the owner of the Chardin was probably François-David Bollioud, seigneur de Saint-Julien (1713-c. 1789), the receveur général du clergé. His residence in Paris became the Hôtel de Lannoy (site of famous interior decorations commissioned in 1798 from Pierre-Paul Prud'hon), and he also had constructed the Château de Fontaine-Française near Dijon, which was built over four years from 1754 to 1758 on the site of an old fortress that was owned by the woman he married in 1748, Anne-Madeleine de la Tour du Pin. See John Ingamells, The Wallace Collection: Catalogue of Pictures. III: French before 1815, London, 1989: P430, 161-165. The second of Hall's four children was Angélique Lucie Hall (1774-1819), known as Lucie. Her daughter from her first marriage, Lucie Garnier [b. 1793], married Charles-Honoré Ditte. Lucie and Charles Ditte's granddaughter, a third Lucie (daughter of their son, Henri Ditte), married in 1884 "George de Pembroke, Lord Montgomery," who has not yet been identified among the earls of Pembroke and Montgomery. Although the sale catalogue for the 1922 sale in which the NGA Chardin appeared describes her as "Madame Ditte, née de Montgomery," she was actually Madame de Montgomery, née Ditte. See Régine de Plinval de Guillebon, Pierre Adolphe Hall, 1739-1793, Miniaturiste suédois, Peintre du Roi et des Enfants de France, Paris, 2000: 26, 42, 65, 93, 161. According to Harriman collection records in NGA curatorial files. The painting was published in a 1933 reference as belonging to the Timkens. Exposition Chardin et Fragonard, Galeries Georges Petit, Paris, 1907, no. 6. French Painting and Sculpture of the XVIII Century, The Metropolitan Museum of Art, New York, 1935-1936, no. 25, repro. 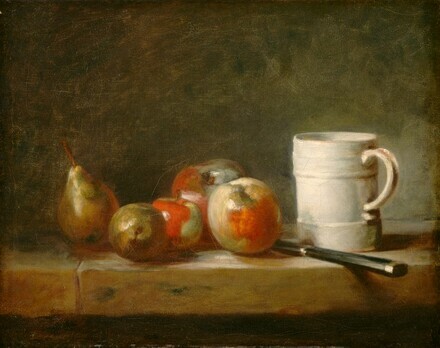 Chardin and the Modern Still Life, Marie Harriman Gallery, New York, 1936. The Painters of Still Life, Wadsworth Atheneum, Hartford, 1938, no. 53, repro. Contemporary French Paintings from the Collection of Governor and Mrs. Averell Harriman, Albany Institute of History and Art, 1955, no cat. Pictures Collected by Yale Alumni, Yale University Art Gallery, New Haven, 1956, no. 21, repro. Trends in Painting 1600-1800, Albright Art Gallery, Buffalo, 1957, unnumbered catalogue, repro. Summer loan exhibition, The Metropolitan Museum of Art, New York, 1958, no cat. Exhibition of the Marie and Averell Harriman Collection, National Gallery of Art, Washington, D.C., 1961, unnumbered catalogue, repro. 9. Loan for display with permanent collection, Art Museum of South Texas, Corpus Christi, 1974-1976. Fragonard and His Friends: Changing Ideals in Eighteenth Century Art, Museum of Fine Arts, St. Petersburg, Florida, 1982-1983, no. 30, repro. European Paintings: An Illustrated Summary Catalogue. National Gallery of Art, Washington, 1975: 68, repro. Rosenberg, Pierre. L'opera completa di Chardin. Milan, 1983: no. 169, repro. Walker, John. National Gallery of Art, Washington. Rev. ed. New York, 1984: 323, no. 424, color repro. European Paintings: An Illustrated Catalogue. National Gallery of Art, Washington, 1985: 87, repro. Roland Michel, Marianne. Chardin. Paris, 1994:178. The Arts of France from François Ier to Napoléon Ier. A Centennial Celebration of Wildenstein's Presence in New York. Exh. cat. Wildenstein & Co., Inc., New York, 2005: 78 (not in the exhibition). Conisbee, Philip, et al. French Paintings of the Fifteenth through the Eighteenth Century. The Collections of the National Gallery of Art Systematic Catalogue. Washington, D.C., 2009: no. 18, 92-95, color repro.